Designers: Karim Rashid, David Palterer, Antonio Cagianelli, Pawel Grunert, Luca Sacchetti. The Galleria Paola Colombari is pleased to announce the opening of the show “Religious Contemporary Design” on April 18th durino the Salone del Mobile. The show is an invitation for artists and designers to reflect on the social changes of the twenty-first century and its spiritual expression through forms: new languages and imaginative codes. 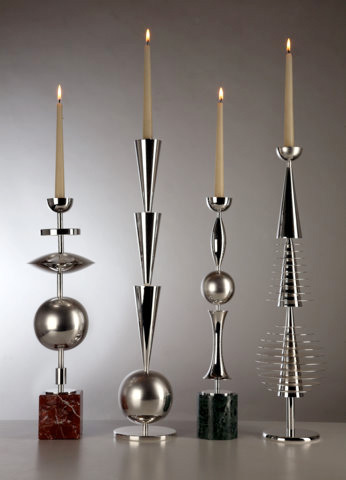 The Gallery will present the work of artists and designers who interpret in a unique manner the very act of creating. Each form has its own “divine” force in the process of passino from thought to existence. These works possess a sensualità, a conceptual message through symbols and signs. Art and Design intersect in secret paths in which the matrix of matter becomes a common religious inspiration. Maïmouna Patrizia Guerresi is an artist who inhabits a transcultural context where diverse languages merge through the iconography of Muslim Africa. 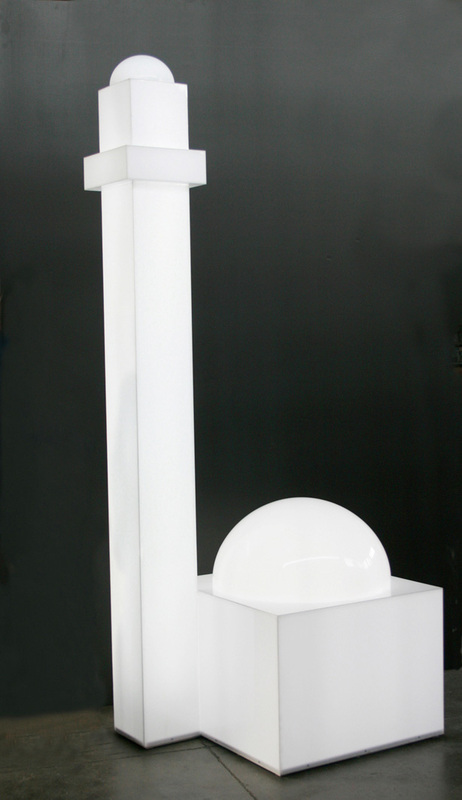 Maimouna presents in this show a work entitled “Fabbrica Minareto”, a grand sculpture in the form of a Minaret composed of sheets and semi-spheres of white opaque plexiglass. It resembles a rationalist architectural structure. This pure volume, designed based on the “golden mean” is a solid form with an almost “classical” consistency. David Palterer, a refined artist and designer, concentrates his research on a methodological and formal experimentation of the object through a “poetical reaction” and reflective experiences. On view is his new collection of Jewish liturgic objects, created for the historical brand Pampaloni Argentieri. 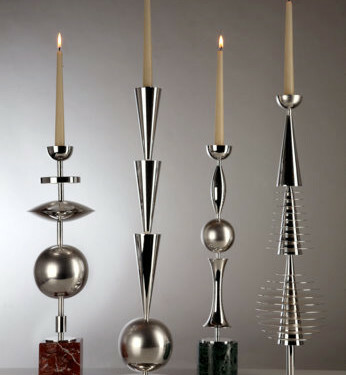 In fact, for this new collection Pampaloni Argentieri chose candelabra and silver vases in order to unite tradition and design. Furthermore, two wonderful ethnic Nepalese masks (made of wood, pigments, and hand-blown clear crystal inserts) will be exhibited: “They have ears but will not listen” and “They have eyes but will not see”. Karim Rashid is a neo-organic designer who creates sinuous and futuristic forms. For Rashid, if freedom were to have a shape, it would be infinite, undulated, light, biomorphic, and in constant movement. On view will be his “Opposite Table”, produced by Base in ABS and in various colors (white, yellow, and black). It is a confrontation of an identical forma s a reflection of two contrasting parts of life: good/evil, joy/pain, happiness/sadness. However, these oppositions do not destroy the beauty of living. One form actually supports the other and together they find the right equilibrium in order to express their essence to the fullest. Luca Sacchetti, a designer and artist who follows Buddhist philosophy, presents the work “Castello di Aurora”: a sofa-sculpture which signals the beginning of a fairytale, the first charter of the Human Odyssey in search for love. The curvilinear of the feminine form protects the entire structure of the Castle, transparent like those who have nothing to hide and as a consequence vulnerable to envy and jealousy. 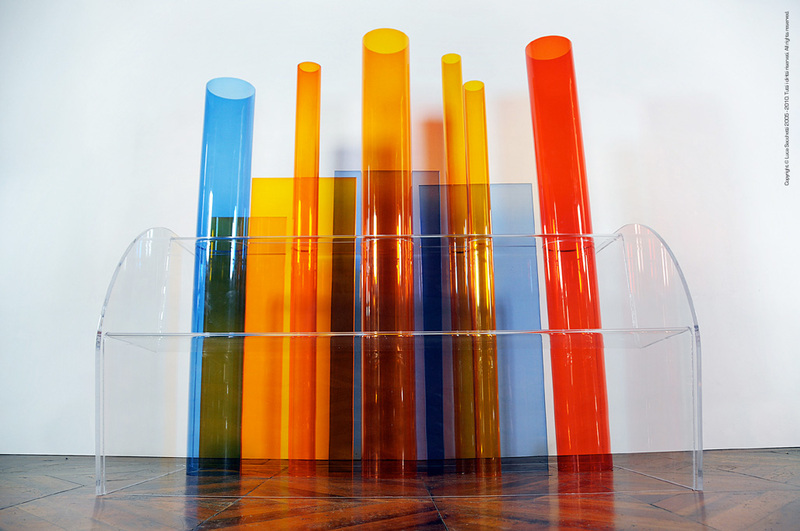 Great towers with a cylindrical shape are alternated with square and angular forms, creating through the alternation of shape and color a frame for life itself. The Polish designer Pawel Grunert explores the theme with his beautiful stainless steel “SIE52 Chair” in the form of the cross. The natural elements which Grunert uses in his work take on an almost pantheistic and immaginary meaning. His motto is “archetype, nature, geometry”. Wicker and stainless steel are his masters and the materials for true sculptures. Blue and Joy come from a new generation of post-pop artists. Through their visual cartoon language, they have creates two characters: Blue (who is sad but is successful in life) and Joy (who is happy but suspicious of life). Through their slogans and messages they express a fragile and intense exchange which allows the viewer to meditate on modern life. 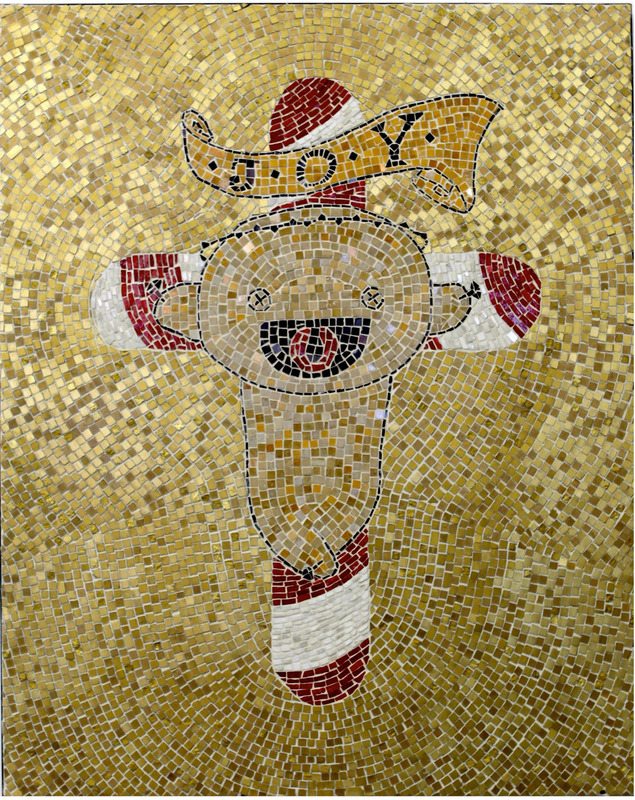 In this show, the duo will present the mosaic “J.O.Y.”, which depicts Joy in an almost imperialist stance. This work elaborates Christian religious iconography through the use of mosaico in travertine marble and glass applied on masonite board and thus recalls the antique Roman glass and marble mosaics. Joys is laughing even though he is being crucified, a playful and provocatory language which invites us to go beyond reality. Antonio Cagianelli is a surrealist and transgressive designer who has anticipated many tendencies. In this show he presents the console “Il teschio tatuato“, an allegory of the ambiguity of good and evil. The polyvalent symbols of the skull is used as symbol of religious terrorism and flames are used as symbols of faith and purification. The theme of the tattoo is like a puzzle in which different fragments of life converge towards the ultimate essence of man, that is, death. 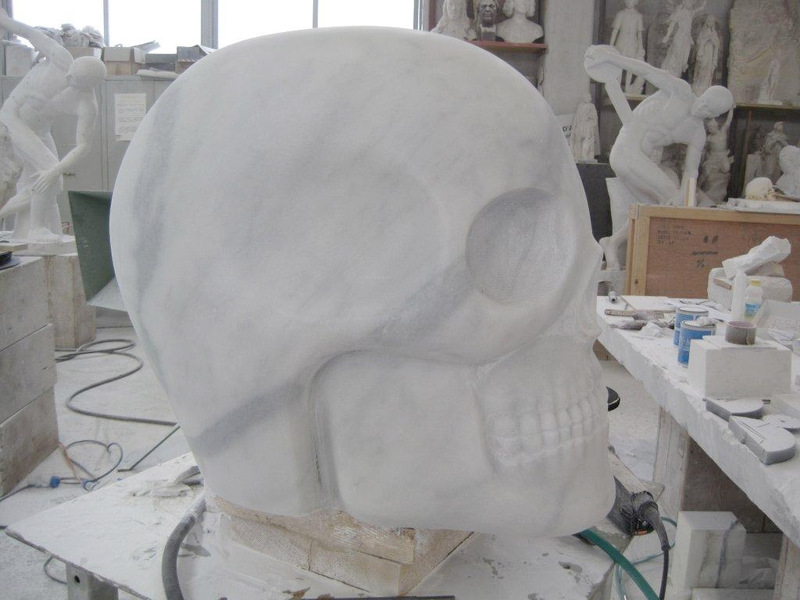 Also on view is the skull-stool “Trans-marble vital” in white marble produced by the Statuaria Arte di Fiammetta Vannelli for the Edizioni Galleria Colombari. It is a reflection on life and death through the concept of Vanitas. Vases in ceramic hand-painted by Cagianelli with graffiti and surreal symbolic iconography will also be on view. 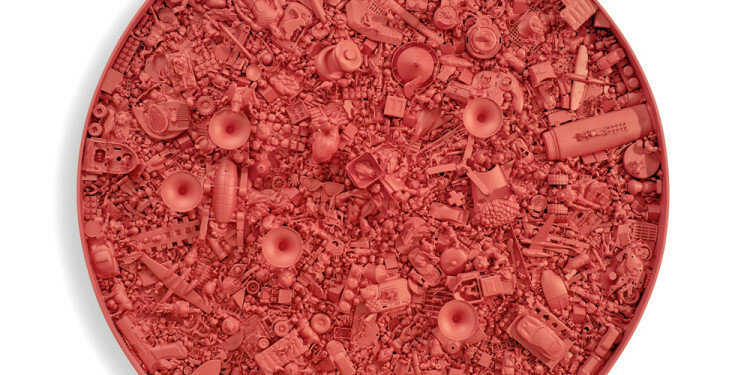 Matteo Peretti, a tactile and post-pop artist, presents the work “Betty Boo”, with its strong and incisive monochromatic red. 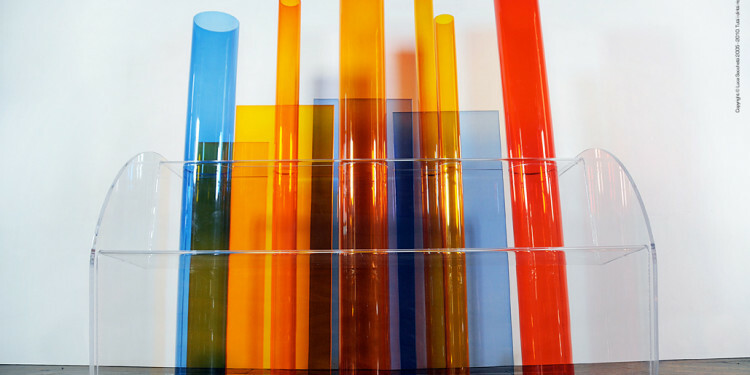 It is an explosion of glazed objects which introduce through their materiality a language both playful and obsessive. His intensely visual pieces penetrate the viewer and lead us to reflect: the delirium of reality is evoked and plastified and suggests an accusation of massification, standardized fetish in our everyday life. These toys and trouvailles are superimposed as in a battle. They attract us and then affect us profoundly by taking us to a theater where we can imagine forms of survival. 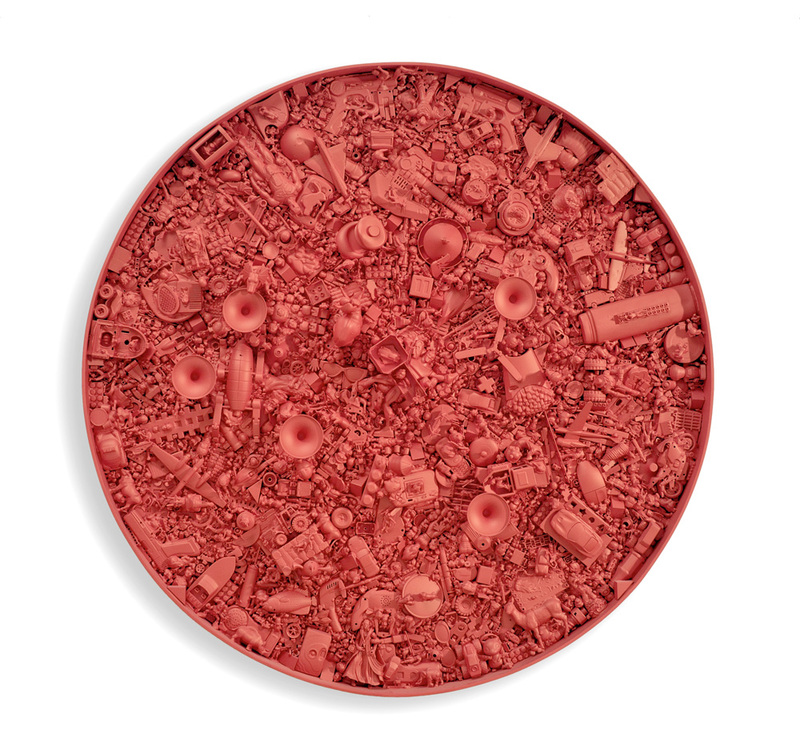 The work “Betty Boo” suggests destruction, like an image taken from above of a city destroyed by an earthquake or war. 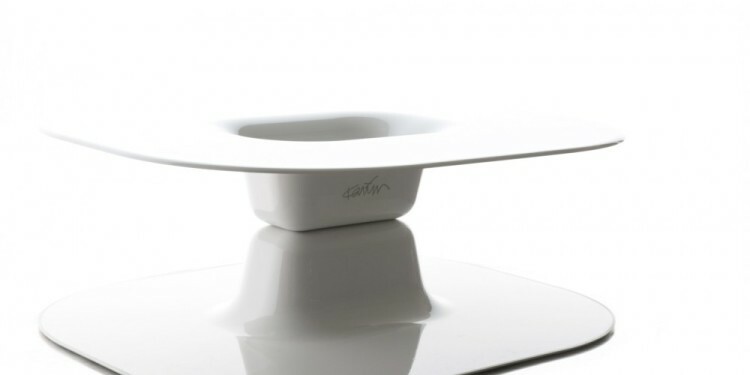 Designer: Karim Rashid, David Palterer, Antonio Cagianelli, Pawel Grunert, Luca Sacchetti. La Galleria Paola Colombari inaugura il 18 Aprile durante il Salone del Mobile la mostra “The Religious Contemporary Design” ed invita artisti e designer a meditare sul cambiamento sociale del XXI secolo e sulla sua dilatazione spirituale attraverso le forme, i linguaggi ed i nuovi codici immaginifici. In mostra saranno presenti opere di designer ed artisti che interpretano singolarmente lʼatto della loro creazione, ogni forma ha una sua forza “divina” nellʼatto del passaggio dal pensiero allʼesistenza, una sua sensualità, un suo messaggio concettuale attraverso il segno. Arte e Design si intrecciano in segrete vie e percorsi attigui in cui la matrice della materia diventa ispirazione religiosa comune. Maïmouna Patrizia Guerresi artista che si inserisce in un contesto transculturale dove si fondono diversi linguaggi attraverso le iconografie dellʼAfrica Musulmana , presenta lʼopera “Fabbrica Minareto” una grande scultura a forma di Minareto formata da lastre e semisfere in plexiglass bianche opaco assomiglia ad una struttura architettonica razionalista, questo volume puro disegnato sulla sezione aurea possiede un solido impianto di consistenza quasi “classica”. 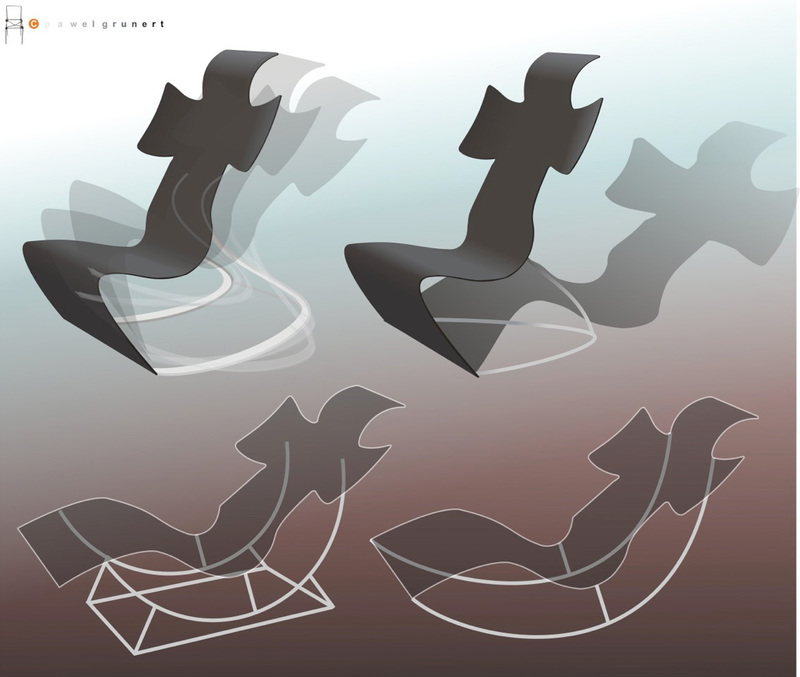 David Palterer raffinato designer ed artista concentra la sua ricerca attraverso una sperimentazione metodologica e formale sullʼoggetto a “reazione poetica” e ad esperienze riflessive, in mostra la sua recentissima collezione di oggetti liturgici giudaici firmata per lo storico marchio Pampaloni Argentieri, candelieri e vasi in argento per la nuova linea di Gianfranco Pampaloni in cui ha voluto unire tradizione e design; in mostra anche due splendide maschere etnologiche nepalesi “Orecchi hanno è non ascoltano” e “Occhi hanno è non vedono” in legno, pigmenti ed inserti in cristallo chiaro soffiato a mano. 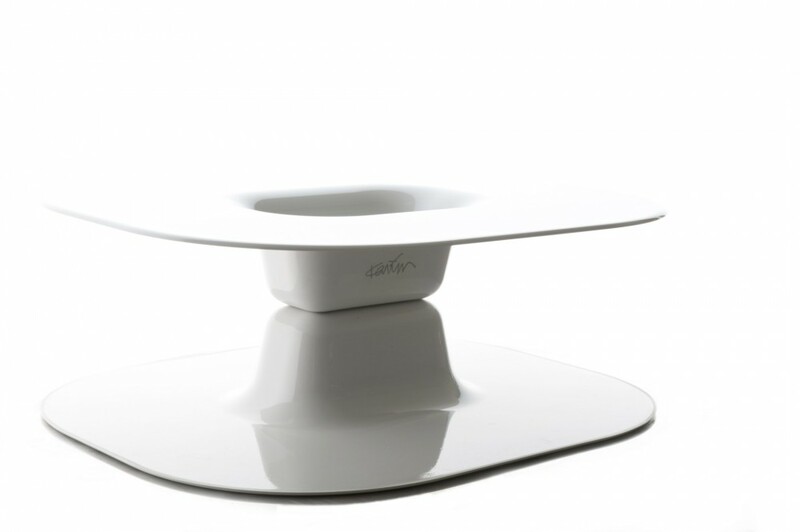 Karim Rashid designer neo-organico con le sue forme sinuose ed avveniristiche in cui se la libertà avesse una forma sarebbe infinita, ondulata, leggera biomorfa ed in movimento perpetuo presenta “Opposite Table” prodotto da Base in ABS realizzato in diversi colori bianco, giallo e nero; contrapposizione di una forma identica come riflessione di due parti opposte della vita, bene/male, gioia/dolore, felicità/tristezza che esalta e non abbatte la bellezza stessa di vivere. 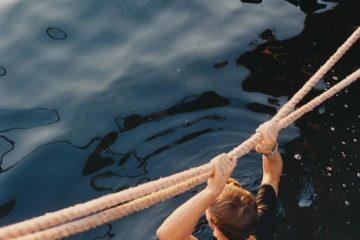 Una forma è sostegno dell’altra ed insieme trovano il giusto equilibrio per esprimere al meglio la propria essenza. Luca Sacchetti designer ed artista, amante della filosofia Buddista presenta lʼopera il “Castello di Aurora” un divano-scultura che segna lʼinizio della fiaba, primo capitolo dellʼOdissea Umana alla ricerca dellʼamore. Il curvilineo del femminile forma e protegge lʼintera struttura del Castello, trasparente come chi non ha nulla da nascondere e perciò vulnerabile allʼinvidia e alla gelosia. Torrioni di forma cilindrica si alternano alle dimore dalle forme squadrate e angolari creando nel loro alternarsi di posizioni e colore una cornice di vita. Il designer polacco Pawel Grunert si diletta sul tema con una bellissima SIE52 chair in acciaio inossidabile a forma di croce, designer naturalistico le sue opere fatte di elementi rurali assumono quasi un significato panteistico ed immaginifico. Il suo motto è “archetipo, natura, geometria” il vimine e lʼacciaio inossidabile sono i suoi master, codici a cui non puoʼ rinunciare creando delle proprie e vere sculture. Blue and Joy artisti post-pop della new generation con i loro linguaggi fumettistici con la creazione di due personaggi omonimi “Blue” triste ma nella vita vincente e “Joy” allegro ma nella vita dubbioso per lʼopposto, mettono in pratica con i loro slogans e messaggi un interscambio fragile ed intenso, puerile e meditativo della nostra vita moderna. 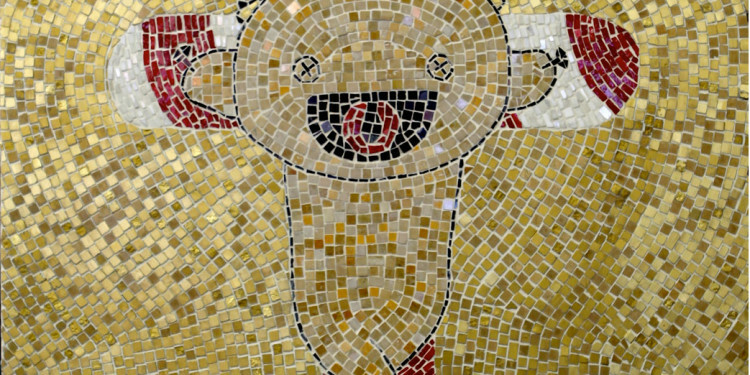 Un universo spesso surreale sperimentato attraverso le loro avventure, in mostra il mosaico di “J.o.y” in croce in atteggiamento quasi imperiale assume unʼelaborazione iconografica religiosa cristiana dallʼeffetto antico con le tessere di mosaico in marmo travertino e vetro su masonite che ci ricordano i marmi ed i vetri antichi romani. Joy ride nonostante sia crocefisso, un linguaggio ludico e provocatore che ci invita ad andare oltre la realtà. Antonio Cagianelli, designer surrealista trasgressivo ed anticipatore di molte tendenze presenta la consolle “Il teschio tatuato” lʼopera è lʼallegoria dellʼambiguità del bene e del male, i segni polivalenti del teschio e delle fiamme utilizzati come simbolo di terrorismo religioso e le fiamme simbolo di fede e di purificazione, diventano al tempo stesso maledizione e morte nella cultura rock post-punk e il tema del tatuaggio è come un puzzle in cui i diversi frammenti della vita convergono verso lʼessenza ultima dellʼuomo, cioè la morte. 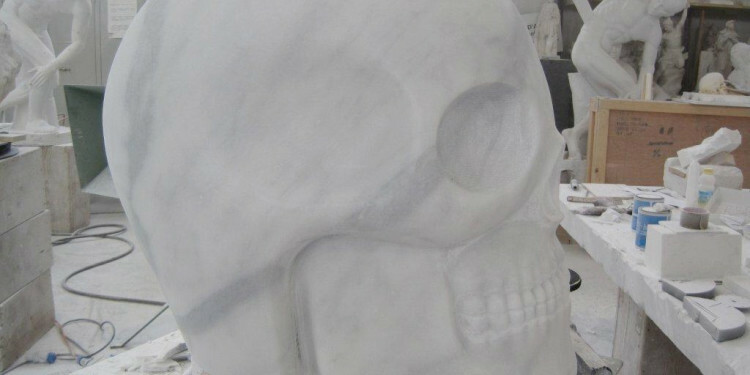 In mostra anche un teschio – seduta “Trans-marble vital” prodotto in marmo bianco venato da Statuaria Arte di Fiammetta Vannelli per la Edizioni Galleria Colombari, è una riflessione sulla vita e la morte attraverso il concetto di Vanitas in cui si ha una rappresentazione simbolica del passaggio effimero dellʼuomo sulla terra e il suo destino finale di sparizione e annullamento. In mostra anche i vasi della storica manifattura Gialletti di Deruta, in ceramica dipinta a mano con graffiti ed iconografie simboliche del linguaggio surreale di Cagianelli. 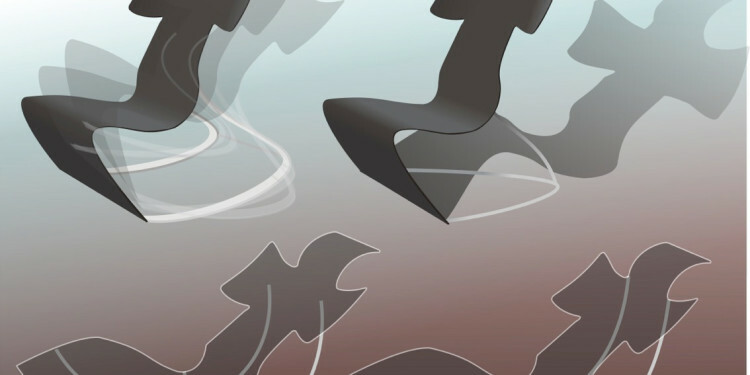 Tattile e materico lʼartista post-pop Matteo Peretti che presenta lʼopera “Betty Boo” unʼopera dal colore rosso, vivo, forte, incisivo, unʼesplosione di oggetti glassati e resi monocromi dalla sua matericità che introduce con un linguaggio giocoso ed ossessivo allo stesso tempo. La sua opera intensa e visiva, ci penetra e ci fa riflettere, il delirio della realtà è evocato e plastificato e ci conduce verso quella denuncia di massificazione, di feticcio standardizzato della nostra vita odierna, soffocati dal delirio di un processo immaginifico. Quei giocattoli e trouvailles sovrapposte come in una battaglia, ci attraggono per un attimo per poi colpirci profondamente e trasportarci in quel teatro da cui pensare per un attimo come emergere per sopravvivere. L’opera BETTY BOO, ci restituisce un’idea di distruzione, quasi un’immagine dall’alto di una città devastata dal terremoto o da eventi bellici.